The Victorian Bishops have issued a pastoral letter on the Voluntary Assisted Dying Bill 2017, raising numerous concerns with the proposed legislation, Melbourne Catholic reports. Melbourne Archbishop Denis Hart, Ballarat Bishop Paul Bird, Sale Bishop Patrick O'Regan and Sandhurst Bishop Leslie Tomlinson sent the pastoral letter to all parishes in the lead up to the debate over the controversial assisted dying bill in parliament next week. We recently wrote to you sharing our concern at the plan to introduce assisted suicide and euthanasia in Victoria. Since then, leaders of Christian churches and other religions have united in publicly expressing their opposition to such laws. Indeed the Australian Medical Association and the World Medical Association maintain that doctors should not be involved in either of these practices. In spite of this, the Victorian Government has now introduced a bill to the parliament that uses the euphemistic term “assisted dying”. We need to be clear: this law will change the criminal code to permit doctors and other health professionals to become actively and deliberately involved in the premature death of patients. 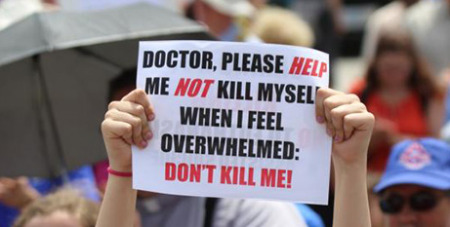 No "safeguards" can ever guarantee that all deaths provided for under the proposed laws will be completely voluntary. Whether because of carelessness, error, fraud, coercion or even self-perceived pressure, there will always be a risk. Victoria abolished the death penalty because we learnt that in spite of our best efforts, our justice system could never guarantee that an innocent person would not be killed by mistake or by false evidence. Our health system, like our justice system, is not perfect. Mistakes happen. To introduce this law presuming everyone will be safe is naïve. We need to consider the safety of those whose ability to speak for themselves is limited by fear, disability, illness or old age.